@dylans Copy and paste it. It’s behind a pay wall. You can also read it if you have an ESPN+ subscription which is nice that you don’t need an Insider subscription now. I will say that I was surprised to see TCU at #6 on their list. Start with the fact that Udoka Azubuike made 77 percent of his 2s last season while carrying a normal offensive workload. Should Azubuike develop a jump shot, it would be great for him and fantastic for Kansas fans and the NBA personnel who will be evaluating him this season. But we shouldn’t understate the damage that a 77 percent 2-point shooter does to an opposing defense. Azubuike is getting as many points per 100 attempts as would a 51 percent 3-point shooter. That’ll do. Better still, Azubuike will have a ton of help. Freshman Quentin Grimes is projected as a 2019 lottery pick, and Memphis transfer Dedric Lawson already has 65 Division I games under his belt wherein he was his team’s featured scorer (and he still seems to possess untapped 3-point potential). Lagerald Vick hit 52 percent of his 2s and 43 percent of his 3s for KU in the 2018 NCAA tournament. California transfer Charlie Moore is a plug-and-play point guard, unless freshman Devon Dotson fills that need for Bill Self. If the Jayhawks stay healthy and play to their potential (and especially if Azubuike or Marcus Garrett or both improve at the free throw line), this should be the best offense in the nation in 2019. We should have a top 10 offense. I’d like to see our defense there as well. There’s no excuse for this squad to be subpar or an average defense with the athletes we have. I actually worry more about the offense. I need to see this team in action. Yeah it will be interesting to see how the pieces fit on offense. I’m actually not concerned about the offense overall but I do think its going to be a unit that progresses over the season. We have 10 guys who could start almost anywhere which is insane to think about. Self has always figured it out especially when he has the talent to work with. @BeddieKU23 I think the defensive issues were mainly centered around not having enough players. Kansas had the #3 Kenpom adjusted defense in 2016. A team where the player with the 5th most minutes played 18 minutes a game. There were so many times over the last couple years where we would see players like Graham and Mason having to conserve energy on the defensive end. Self can wave teams again this year, so I would be on a top 10 defense for sure and it won’t shock me if it is top 5. @BShark Great point. I also think we had limited defensive minded folks playing on the perimeter. Athletically wise, replacing Dedric for Svi will be huge. Malik wasn’t that interested in playing defense, and Vick wasn’t either at times. I give a pass to Devonte because his legs were about ready to fall off playing all those minutes. The depth will help a lot, but the athleticism we are adding is simply off the charts as compared to last year. I think we have a shot at being the best defensive team in the country. Well Dedric isn’t very athletic, by elite standards anyway. That’s why he is in Lawrence instead of some NBA city. That said, Svi has TRex arms and the Lawsons have freak show length. So that is an immediate upgrade. Newman bought in late, but Grimes should be an upgrade as long as he buys in. Better size and length. Good point. Not having players has been an issue. Playing 4 guards/wings also had a big impact the past few seasons. Since that 16 season the defense has trended in the wrong direction, #24 & #47 (Kenpom). It’s amazing to think the #47 ranked defense made it to the Final 4 last season. It will be interesting to see what some of the new guys can do defensively. I know Dedric is a good to elite rebounder and so is his brother. Dedric can also protect the rim some which really adds an element we have lacked the past few seasons. Doke for his size is neither a good rebounder or rim protector. I don’t expect that changes but there’s always hope another off-season and some NBA motivation will do the trick. I think he lacks the instincts though so we get what we get with him. Absolutely no reason for this team to not be Top 5 defensively. We have all the length, athleticism and rim protection in the world. Add in that we are two deep at every position, and our guys better be playing aggressive as hell. This is right. People sometimes forget that defensive rebounding is part of defense, and Kansas ranked 102nd in the country in defensive rebounding last season. This was in large part due to playing a 4-1 lineup. This season, Self should have a 3-2 lineup on the floor almost all of the time. And there will be times where it may look like more of a 2-3 lineup with KJ playing the 3. There’s also the fact that KU will have the personnel to be an excellent rebounding team this season. Doke, for his size, is not a good rebounding big. But both of the Lawson’s are long, and Dedric has a quick second jump. De Sousa averaged 16.8 rebounds per game per 40 minutes last season, and 12.6 rebound per 30 minutes. He should be an absolute monster on the boards. McCormack should be good due to his size. Lightfoot will be decent. I’m expecting Kansas to be one of the best rebounding teams in the country this season, which should help them to be better defensively as well. I think a lineup of Garrett, Grimes, KJ, Dedric, and De Sousa could be pretty devastating defensively. Heck just grabbing the dang rebound so you don’t have to play more defense should make the team better by limiting the other teams opportunities. Perimeter pressure has been lacking the last few years and I’m not sure if it’s just due to athleticism or a lack of an inside defensive presence. It would be nice to be able to get stops and not have to rely so heavily on just out scoring teams. Is it possible we all learned a lesson over past seasons? It seems like many of us were lured into BGreene’s “potential.” It was a kind of greed view. Have more. Looking at it like finances… there are those who just want to make as much money as possible and not care about anything else. They always think they can out-earn their spending habits, which often are driven out of convenience because their time becomes so valuable. But what happens when the well runs dry? All those expenses. Look at extreme cases like Allen Iverson. I’m not certain… but wasn’t his final debts almost equalling what he earned in his career? Somehow… Self needs to teach his players to not take plays off… on either side of the ball. Because taking plays off leads to preferences, and most young players would rather play offense than defense. I think Self has to push BALANCE! I think Virginia is an example where too much emphasis is put on defense. They were a team quite capable of going 10 clock minutes without a point. Players need offense. It’s more than just putting points on the board in hopes of winning. Offense is a reward! It should be the reward for working hard on defense! I think the floor for this KU team is pretty high. The ceiling is the really interesting question. I think we need Grimes to be a beast. @BShark and Dotson to catch on quickly! @Crimsonorblue22 I’m not too worried about Dotson but yes he will be needed. Ceiling is a legit undefeated team. But it would take a lot for that to go right obviously. But I can honestly say I wouldn’t be shocked if that happened. We shouldn’t be hurting on either end from guards or posts. I just think the defense should be so dominate that we won’t even be concerned with the offense. Especially if KJ, Garrett and Dedric all improve from trey. That puts us at 71 ppg. If the defense is one of Bill’s better, we would give up close to 65 ppg. That puts us at a floor of 9 losses according to Bill Self history. If this team can get to 80 ppg, and give up 65, they are a 3 loss team. So we need 9 more points to come from somewhere and I think that puts us right there at 3 losses. And there is plenty of places that could come from on this team. So I’ll go out on a limb and project us as a 2 loss team, as I think we score about 81 ppg and give up around 63. @Kcmatt7 I’m drinking your koolaid. @Kcmatt7 I see you have McCormack as the substitute for Dok. I have De Sousa as the first big off the bench for Dok or Dedrick. If he’s eligible and KU elects to play him, De Sousa deserves as many minutes as coach can get him and he will be invaluable at the 4 or 5. We’ll see if the second big off the bench is Lightfoot or McCormack. That’s a pretty nice problem to have: Experience and energy vs. size and potential. The decision on Lightfoot or McCormack will likely vary from game to game depending on the game situation and the week’s practice effort. Self won’t go 10 deep by the time the final rotation is set. Most likely he’ll go 8 deep, possibly 9 at the most. I think it would McCormack and Garrett that see the minutes reduction once the rotation is trimmed down for conference play if it’s an 8 man rotation and just McCormack if it’s a 9 man rotation. McCormack is better than Mitch, right now. No offense at all to Mitch, but KU is at a point where he shouldn’t really be playing. This feels like 9 due to the depth. I would figure Ochai, Mitch and McCormack to be the players being on the outside. Very interesting to see how it all shakes out though. According to various players interviews over the Summer and reports of practice games, Moore is currently considered the best 3 point shooter and Mitch has been shooting light out from the 3 as well and if he continues to do so, it would be difficult to keep a Big with a solid outside shot off the rotation. Moore, Grimes, Dedric, Vick and Doke (when there is big mismatch) are all capable of having big games. I see KU as averaging mid 80s ppg. The offense will have no problem scoring; too many capable scorers to cover players having bad shooting days. @JayHawkFanToo I actually think this offense might stagnate at times due to outside shooting. @BShark Disagree. The strength of the team is multi layered, from a 7 footer coming off a 77% shooting year, to some of the best dribble drivers on the perimeter we’ve ever had. It’s hard to visualize a completely different offense, but Dedric will be heavily involved, as well as Grimes, Moore/Dotson, and Vick all cutting, driving to the basket. And that’s before we even get to the front line. We aren’t going to be sitting beyond the 3 line, passing the ball around the perimeter like last year. Teams will have to zone us because they won’t be able to stop us playing man to man. This team will also pick up a slew of easy baskets off defensive pressure because he’s going to throw the kitchen sink at other team’s perimeter players. If we miss the steal, we have monsters on the front line to pick up the slack. In some ways, we’re going to resemble Tucky with all the dribble drives. I don’t think stagnant will be the word folks will call our offense, imo. @KUSTEVE I said stagnate at times. Especially early on when large and athletic teams simply pack the paint. It will be a learning experience at least. Jmo. @BShark Always remember my posts have an element of wishful thinking…lol. @BShark Just like us, Coach Self must wake up every day with a big smile as her contemplates the possibilities on offense. Like you, I have Dedric averaging 16-18/game. Of course, I haven’t seen him play, but I think the year off will make him aggressive on offense. During the FIBU tourney, Grimes showed that he’s willing to feed the post. This is going to be fun. The big difference with Grimes from Fiba is he won’t be playing point nearly as much, and it will allow him to get set from 3. Huge difference, imo. I’m going to call > 35% floor, with a 40% ceiling from 3. I do think this team is very good, a top 5 team for sure. It’s just when I start looking for potential problems that could result in a less than ideal tournament run, that one sticks out. I have this team at 82ppg, so overall I don’t think offense will be a huge problem. I’m somewhere in the middle of @bshark and @kusteve on the offensive stagnation. On one hand, we’ve seen Kentucky teams with excellent bigs and excellent dribble-drive players struggle offensively because of lack of 3-point shooting. 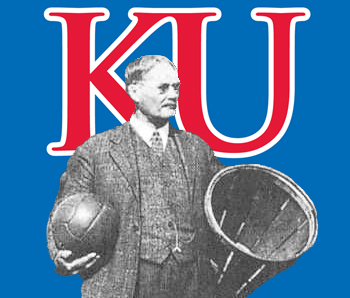 On the other hand, I think this KU team will have better 3-point shooting than those Kentucky teams. Vick and Moore we know can shoot. Grimes is a decent shooter, and he should get a lot of open looks due to: 1. KU having 5 legitimate scoring threats on the floor at all times; 2. Teams packing it in and forcing Kansas to beat them with 3’s; 3. passing out of the post after a double team comes; 4. dribble-drive and kick-out; 5. Transition. I’m expecting Grimes to be somewhere around 35-37% from deep. Similar benefits for Dotson as Grimes, and I think he’ll be between 30-35% from the outside. Garrett has been working on his shot. The Lawson’s aren’t great 3-point shooters, but they aren’t horrible either. And of course Mitch has the stroke. My point is I think this KU team has enough outside shooting to prevent it from being a weakness. It won’t be a strength, but it won’t be a weakness. Against 75% of the teams Kansas plays this season, they can still win despite horrible perimeter shooting. But if they do that against Kentucky, Tennessee, MSU, Villanova, at West Virginia, at KState, or against a good team in the tournament they will probably lose. I think this team loses 4 games before the NCAA tournament, but I’d love to be wrong. I think De Sousa, if eligible, will get as many minutes as he is capable of playing without fouling out. @JayHawkFanToo 83.2 ppg is the best offense in the Self era. If this team gets to 83 ppg, I’m not sure they lose a game. Because I seriously think this team has a chance to lead the country in blocked shots and will suffocate opponents on that end of the floor. @Texas-Hawk-10 You’re probably right about that. Will be hard to keep Garrett off the floor though. Looks like your number are not that different than mine except you have Big Dave and Mitch not scoring at all. If you add just 3 points for Mitch and Big Dave combined then you are at 85 ppg. I am just not seeing the 3 point shooting as being a weakness. Vick and Moore will be at or above 40%, Mitch has a good stroke from outside and so do the Lawsons. Grimes was hitting just fine from the international 3 point lane which is farther than college, Garret will be much improved (I predicted mid to upper 30s) and Dotson has the potential to be good as well. Also, when Doke is hitting over 70% from the inside, it is the equivalent of a 3 point shooter shooting 50%+. I can see several 90+ point games on the schedule and a season average of 85 ppg does not seem that far fetched. The good thing is that just about every player is capable of scoring, obviously some more than others, but it would not surprise me to see Dedric, Vick, Moore, Grimes and Doke have 25-30 point games. If a player is having a bad day, there is another ready to take over the slack. This team is as deep as last season’s team was thin; at least 2 quality players at each position with most being able to play multiple positions. I think Self will go with 9 players: Dotson, Grimes, Vick, Dedric, Doke and Garrett, Moore, KJ, and De Sousa. That leaves McCormack, Lightfoot and Agbaji. In my opinion McCormack should be the first player off the bench in that group. He’s almost in his own category. Maybe we can call him a super reserve. He can play if a player is ineligible, or if there’s foul trouble, or if a player is injured, or if Self is just pissed off at the regular rotation players for some reason. The two bench players who I am really excited for are Garrett and De Sousa. Both players had good moments as freshman last season (Garrett throughout the season and De Sousa at the end). Garrett was above-average at just about everything except shooting. And the rumor is he’s been working on that this offseason. If he can become an average shooter, or at least improve his free-throw shooting, I would seriously consider starting him. De Sousa kind of reminds me of a more skilled and bigger Jamari Traylor. He has the most upside of any big man on the team and I would give him as many minutes as possible. Don’t count Mitch out. He bulked up big time in the off-season and his already good outside shooting is even better. Keep in mind that he was the best shot blocker for KU and his additional weight will allow him to match up with bigs better than he did before. He is now a stretch 4 that can draw his man out and open up the middle. So many options, so little play time. @Kcmatt7 McCormack is good but I still don’t see him getting much run as long as Silvio can play. @JayHawkFanToo I think that 40% number is ambitious. Moore was 35% in his one year at Cal and Vick in his two seasons playing real minutes is at 37% each year. If Garrett gets to 35% or higher I’ll buy you a beer for that prediction. If the Lawsons can both be in the 33% range that would be pretty great. I’m still hopeful that Moore is a 15 mpg tops guy so I don’t think he will have any 25+ point games. If you read the interviews with team players throughout the summer, all indicated that Moore is a much improved shooter and currently not only the the team’s best 3 point shooter bu also the fastest and at time unguardable. I see him averaging 20+ mpg, at least until Dotson get acclimated to college ball. @JayHawkFanToo I think we will see some of those too. But I think Bill, more likely than not, won’t let us play at a pace that allows us to average 85 ppg for an entire season. A full two points better than his BEST scoring team in 15 seasons seems unlikely. Possible, but just not likely. Lip service imo. Dotson is faster with the ball and has better PG instincts from what I have seen. Obviously we need to see Dotson play real games at the P5 level. Moore is more of a scorer and definitely a better shooter than Dotson. @Kcmatt7 Yeah, even last year KU was #144 in adjusted tempo. I think this will be a great scoring team, but I don’t think this will a great shooting team like we’ve seen the past couple of years. I don’t see anyone being 40%+ shooter from deep that you have to guard. I foresee a lot of teams packing the paint and forcing KU to try and beat them from deep. I think we’ll see some games this year where KU goes 7-8 minutes without a FG because this isn’t a great shooting team. Last season KU did not have the depth to play up tempo. Graham was needed to play close to 38 mpg, Svi said that he would like to play about 28 mpg and averaged about 35, Newman averaged about 32 mpg and in the important games their playing time was even higher. If KU went up tempo they could not have played that many minutes. Even then, the team averaged 81.4 ppg and there is no question this is better and much deeper team so 85 ppg seems realistic; keep in mind that OU averaged 84.9 ppg last season and this KU team is much better. I’m not sure that this season’s KU team will even have a player that shoots better than any of those averages. Maybe a few players will surprise us and shoot lights out, but it will be hard for KU to be at 85 points per game unless that happens. On the other hand, I’m not sure KU has ever had a group of players this dynamic in the front and back court in the Bill Self era. So it’s a bit hard to judge for that reason. In my opinion this seasons Kansas team is going to more closely resemble some of the juggernaut Kentucky teams in terms of dynamic ability, but with a little bit less talent and more experience. For what it’s worth, Kentucky’s two best teams under Calipari (the 11-12 and 14-15 teams) were not great 3-point shooting teams or great scoring teams. The 11-12 team averaged 77.6 points per game and shot 37.7% from 3. The team that a lot of Wildcats fans consider to be the best Kentucky team despite not winning a national championship was the 14-15 team that went 38-1 and lost to Wisconsin in the final four. They averaged 74.4 points per game and shot 34.9% from 3. So the good news for this season’s Kansas team is that there is precedent for being really really good without being a fantastic 3-point shooting team. I think this season’s Kansas team will average 79 points per game, allow 63 points per game, and shoot 36% from 3. The only way they average more than 85 points per game is if Roy Williams comes back to coach. @KirkIsMyHinrich Exactly. History says this team will not score 85. And that it is a concerted effort by Bill to do so. He wants to play a pace that is fast enough our opponents get tired and depth is an issue, but not so fast that we take bad shots. Yeah KU isn’t getting to 85 a game unless it’s the best team ever under Self. I think the 82 in my projections could be tough, but I believe the overall talent level of this team is pretty good. @KirkIsMyHinrich Lol. I kept trying to at your other username that I know and was wondering why it wasn’t popping up here. Anyway, if KU defends at the level of those UK teams watch TF out. Those UK teams were pretty damn good offensively, good enough considering their stifling defense and pace. Thx for the numbers and analysis. The most conspicuous thing about UK under Cal—maybe even beyond how many OADs he signs and gets cleared—is how few rings he has won with so many more OADs than Self has had. Each coach has one ring. But Self has NEVER had remotely as many OADs signed and often cannot get some of those he signs cleared to play. Maybe the analogy with those UK teams of ‘12 and ‘15 calls attention to an underlying flaw in Cal’s ”system” of starting so very many OADs and TADs. Maybe Cal’s OAD and TAD laden teams are too poor of 3pt shooting teams to keep from being upset in the Carney, where one off shooting game by UK, or one hot game by an opponent wipes out the OAD/TAD advantage? Maybe Cal has to have 6-8 of the highest ranked 20 players in the country to even have a prayer of winning a ring, because they just don’t tend to shoot a high enough average from trey-ville? UW, which upset ARGUABLY one of UK’s two most talented teams UK has had—had great perimeter trey shooters and a footer that could make the trey and pull UK bigs out. Put another way, maybe it takes 6-8 of the best freshmen in the country to offset mature opponents upsetting you with great 3pt shooting on hot games in the Carney? b.) does this team have enough maturity and 3 point shooting percentage to offset other mature teams with great trey shooting on an opponent’s hot night? KU appears to lack sufficient OADs to win the pure talent route. Alas, KU also seems to lack the combined maturity and 3pt shooting to win the other way. So: KU should be very good, but have a low probability of avoiding upset.